Cottage La Premsa is a authentic stone cottage, that lies within the walled gardens of Farmhouse Mas Nur. Cottage La Premsa is a authentic stone cottage, that lies within the walled gardens of Farmhouse Mas Nur. 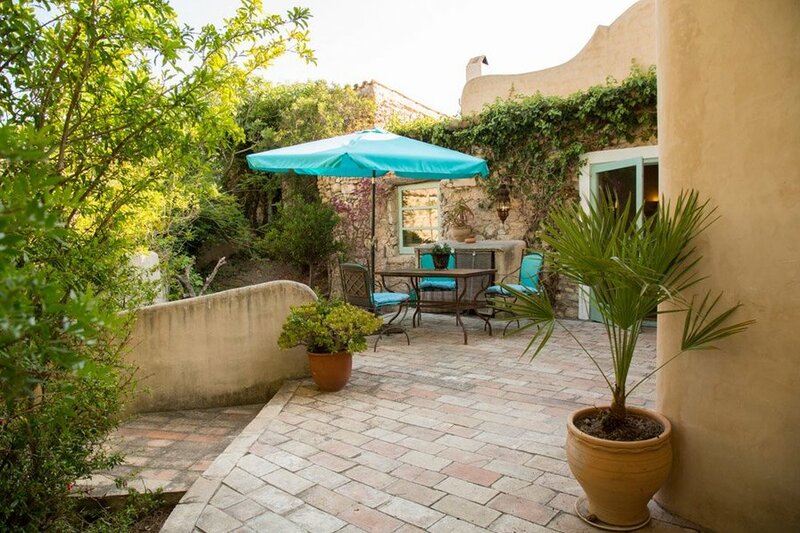 Lovingly restored and decorated by the present owners, it is situated in the fire tree lined hills in the Sitges region, surrounded by the famous Penedes vineyards. Farmhouse Mas Nur is a 300 years old Spanish wine farm and Cottage La Premsa was the former place where they pressed the grapes.It has its own private garden and terrace and 2 beautifully furnished bedrooms.Because of its location it is ideal for that much needed quiet relaxing holiday whether its lazing round the stunning large shared pool on the sun terrace or reading a good book on your own private terrace or days on the wonderful safe beaches of Sitges which are less than a 15 min drive. There are several communal areas, like the breathtaking pool and pool area, with sun loungers, several private corners and unspoiled views over the green Mediterranean hills. The pool and the parking are the only shared places. The privileged location of farmhouse Mas Nur, between the famous Penedes vineyards and the lovely beaches of Sitges (10 min.drive), gives you easy access to go, or see or do what you want. Whether it is to relax beside the pool, go to the beach, hike in the Natural Park, see Sitges(6km) do Barcelona-city(35 min.drive), enjoy Port Aventura or visit the roman city Tarragona, it is all at a short drive. There are myriads of things to do in the direct surroundings, like horse riding, golf (in Sitges) or go shopping in the small romantic streets of Sitges or have a stroll along the boulevard with its beautiful palm trees. Sitges is the most beautiful coastal village south of Barcelona. It has no high rise and several cozy beaches and lovely restaurants and tapas bars along the beach and in the village itself. The whole year around there are many exiting original catalane feasts celebrated Sitges. Spectacular fireworks at the beach en August, art and film festivals and the famous carnival parade. Out of high season it is still a very attractive place with a good climate(even in winter) and not to crowded. The closest village for all your shopping is Sant Pere de Ribes( 4 min drive), a very nice authentic place, with supermarkets, great terraces for your morning coffee or tapas on the central historical square.